The Starnberger See is the Bavarian capital Munich's nearest lake. In the 17th and 18th centuries it was already very popular with the Munich court. The 57-square-kilometre lake is around 20 kilometres long, five kilometres wide and up to 127 metres deep. It is bordered by moraine hills. Walkers can explore the beauty of the landscape and the various sights on the path that follows long stretches of the shore. 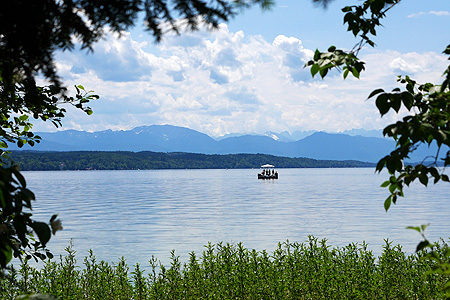 Among the best-known towns and villages on the lake are Starnberg, Seeshaupt, Bernried, Tutzing and Feldafing with Rose Island and the park designed by Peter Joseph Lenné. Tutzing is the location of the Protestant Academy, which today has an international reputation as a meeting place of academics and politicians. The Academy for Political Education run by Bavaria is also in Tutzing. The lake has three large leisure areas: in Kempfenhausen, Ambach and Possenhofen. The remains of prehistoric pile dwellings on the bottom of Lake Starnberg by Rose Island have been included on UNESCO's World Cultural Heritage list. In June 2011, over 100 selected archaeological sites in several countries were declared cultural heritage under the heading of "Prehistoric pile dwellings around the Alps". They provide researchers with unique insights into the ancient world of farming, everyday life, agriculture, animal breeding and technical innovations. The pile dwelling sites in Lake Starnberg, together with other remains of settlements, represent an archaeological heritage which dates back to 5000 BC. For further information about the pile dwellings in Bavaria, please contact the Bavarian State Office for the Preservation of Monuments (Bayerisches Landesamt für Denkmalpflege). The Starnberger See is approximately 30 km south of Munich and can be reached via the A95 motorway from Munich to Garmisch. Paths in the vicinity of the lake include a trail to the Maisinger See on the west side and the King Ludwig long-distance hiking trail from Berg via Herrsching on the Ammersee to the royal castles of Neuschwanstein and Hohenschwangau. There is a connecting boat service from Easter until the middle of October.